In a world of elves and dwarves and sprites and mages, Tane Carver is a human with no gift but his wits. Which, to be fair, did get him into the world's most prestigious university of magical technology. For a while. Until his lack of magic was discovered. And then it all came crashing down. But when a student is murdered on campus behind unbreakable wards, Tane gets a second chance. Solving an impossible crime should be easy for the man who fooled the university's best mages for years. Except he's not counting on the head constable being an old flame who isn't so fond of him anymore. Or on Kadka, the half-crazy half-orc who insists she's his partner - whether he likes it or not. Not to mention the masked mage who keeps trying to kill him. Now, Tane's survival depends on the one truth that has never failed him. The flaw in all magic that those who have it prefer to ignore: the mage. Outsmart the mage, and you outsmart the spell. And outsmarting mages is what Tane does best. 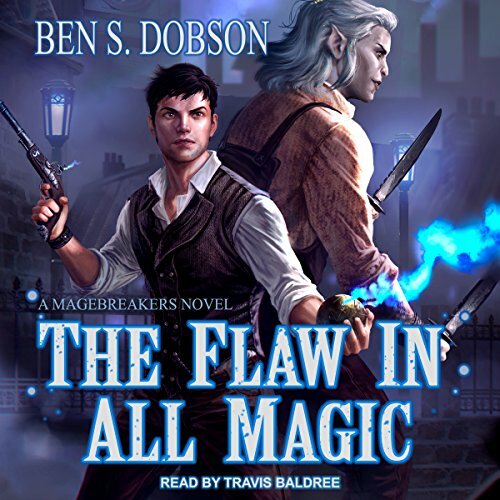 Would you consider the audio edition of The Flaw in All Magic to be better than the print version? I haven't read the print version but based on the audio version I'd be willing to buy it. I really enjoyed the setting. A fun combination of steam punk and fantasy with a healthy dollop of noir. What about Travis Baldree’s performance did you like? I really enjoyed Travis' narration. I like his use of voices and pacing. 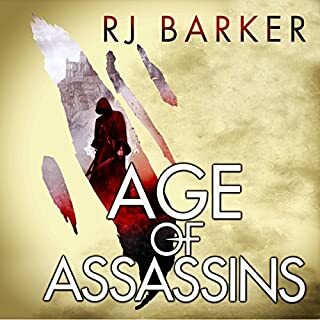 This is the third or fourth book of his that I've listened to and I can safely say that I will be looking for more in the future. 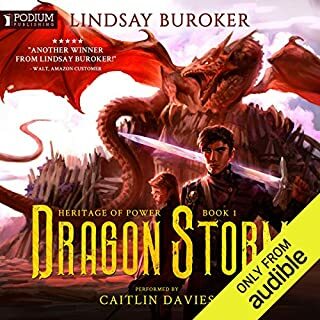 I follow some narrators, because their performance can make or break an audio book. 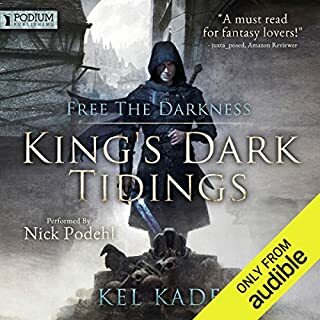 Like George Guidall, Travis Baldree has a voice that is pleasant and consistently improves a story sucking you into it rather than detracting from it. I'm looking forward to listening to the audio book of the sequel as soon as it's available. Amazing Mystery at its Fantasy Finest! Magic plus detectives and a little MacGyver sprinkled on top.... 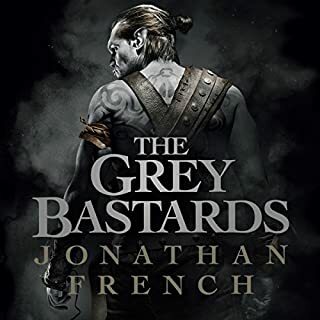 It that doesn’t spark your interest throw in great character development and good humor and a good world foundation... Top it of with few cruse words and a great performance by Travis it is easy one of the best fantasy books this year...! Excellent Fantasy, Steampunk, Orcs, and More! I love streamline, fantasy, and books with orcs in a positive light, underdog heroes, characters you can really get to know, and a good plot. This book has all this and more. Our main guy doesn't do magic but is working for a University for mages due to a murder of one of his friends. He ends up with a new friend, a female half-orc that helps him. The story is so good!!! Lots of twists and turns and I love their partnership! True friendship. The narrator is so awesome! There are lots of creatures in here and he is super at doing all of the strange voices for them, lol! He also performers the voices of women so well I forget it is a male narrator. I forget it is even being narrated! I feel like I am watching a movie in my head. Great job!. An interesting idea carried out to perfection. The story is hilarious the bad guy seminly obvious yet a solid mystery involving magic. 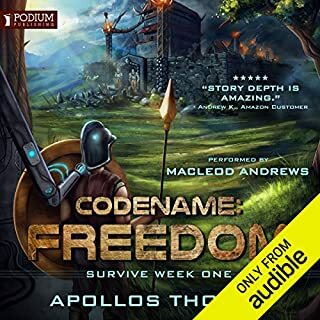 Another winning Travis Baldtree narrated audiobook. 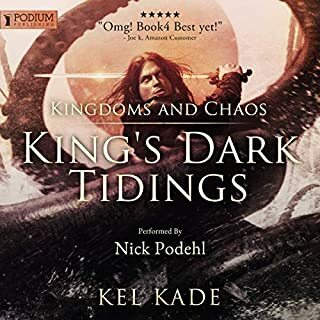 He totally brings the characters alive with emotion (or in Kadka’s case, lack of emotion but full of jokes) and their unique voices. A non magical main character uses his knowledge of the world to solve a crime. I’m not crazy about that premise but it worked. I’m just kind of over the newbie showing up professionals. In this case, the law enforcer, a Blue Cap, if you will (or was it Blue Hat?) is his ex girlfriend. I know. We saw that coming, too. Police being associated with Blue also seemed unimaginative. I wanted new, different, unique. He acquires a partner. You guessed it. He wanted to work alone. I overall enjoyed the world building. It was not an info dump. The third person narrative was a breath of fresh air. Too many books in the genre is first person. Our main character is level headed and NOT snarky!! Double kudos with a triple shot of espresso. It was short and sweet. The climax was a bit lengthier than desired, but mostly because it wasn’t action packed. It flowed with the writing style of the book. I actually adored this book enough to pick up the next in the series. Which is EXTREMELY rare. Strongly recommended for urban fantasy lovers who want a non epic adventure with promising characters who could be your best book buddies! Good start to a new series. Tane Carver is an interesting protagonist. He has courage and determination to prove that a human/being with no magic are not flawed. When there is a murder at the university campus, he and his "partner", Kadka helped to catch the murderer. A very action packed adventure. Will continue the next book. The narrator, Travis Baldree did a good job with all the different voices for both male and female.